Big Effing Q. Every Advent calendar should contain at least one day of NyQuil. Or maybe it’s just me that gets sick every December. More post datery because I spent 20 of the day’s 24 hours sleeping. All week the HVAC has been on the wonk at work such that the air flow is either completely off or full double plus on. The powers that be decided that for the comfort of our patrons that we would be going with the all on choice. I suppose that was the better way to go since we are underground and you can’t really open a window and it gets mighty stuffy really fast with no air. However, when your COLD AIR RETURN is two degrees warmer than the “hot” air coming in…things don’t bode well. That and the constant hooting whistle from the air ducts in the tech area and the thrumming hum in the other offices has made for an annoying week. Four or five days is also longer than the building can retain the heat it has built up so yesterday it was chilly anywhere there wasn’t a giant lightwell. My feet never warmed up which I’m blaming for the return of the cold. So yeah. 4 hours awake. And not in a row. 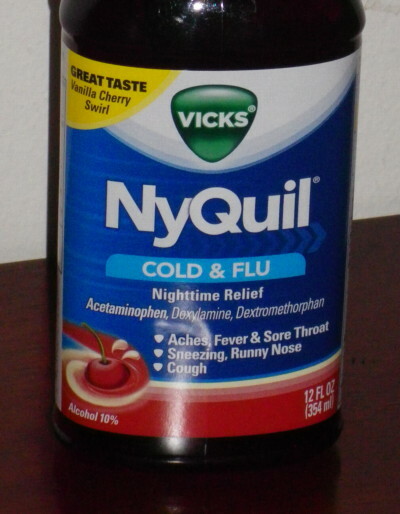 Mmmm, NyQuil. 2008: Guess who didn’t do a hand written post today. WHEEE! 2007: Somehow I’m not sure Yoda envisioned being dunked in lemonade and then given a bath as one of the great mysteries of the force. 2004: is a terrible year for updating. 2003: There is nothing scarier than seeing the faces of entire class room of law students taking a computer exam moments after the power goes ziltch. This entry was posted on Saturday, December 10th, 2011 at 9:47 pm	and is filed under General Bloggery. You can follow any responses to this entry through the RSS 2.0 feed. You can leave a response, or trackback from your own site. December is for getting sick. I don’t think my family has ever had a Christmas during which *someone* wasn’t incapacitated by germs.